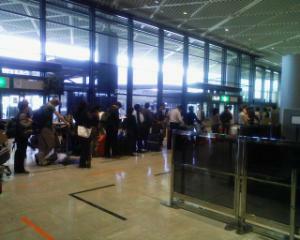 Yep, I'm at Narita airport for the umpteenth time. I almost feel like I've been here on more occasions than I 've been to Kastrup airport in Denmark! Inspite of the airport being less crowded than usual, the lines are unbelievably long and I suspect the cause is increased security. I can't wait to be x-rayed and getting a body-cavity search, woohoo! A guy is passing out some kind of explanation about carry-on baggage but for some reason didn't give me one. It probably says "look out for suspicious-looking Danes" or something. Anyway (such a great word for getting out of a pointless ramble) hopefully I will get to wherever this line ends before my flight leaves, exciting stuff!